As I may have mentioned once or twice(!) 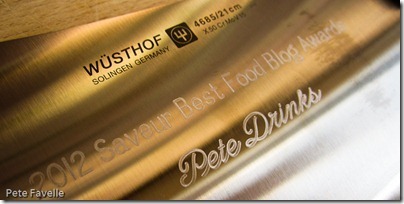 I somehow managed to win Saveur’s “Best Wine Or Beer Blog 2012” award a few months ago. At the time, I thought the only prize was the warm fuzzy feeling of success and some new readers but I recently got an email asking for my mailing address and this morning, a real, physical prize arrived! 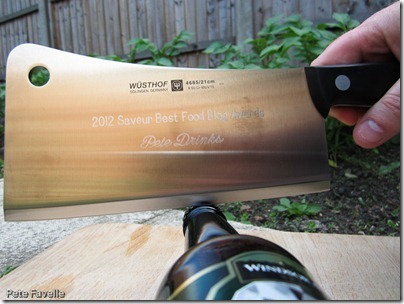 This is a magnificent engraved 8″ Wusthof cleaver. Now I’ve owned a couple of cheap and cheerful cleavers but this is a very different beast. The blade is around 3/16ths of an inch of beautiful, polished steel alloy, weighs around a ton and a half and is so sharp that I think if you dropped it on your foot you’d not only have no toes, but you’d have to go down to the next floor to get the thing back. Of course, I’m more of a drink blogger than a food blogger so I shall have to find a suitable use for it. 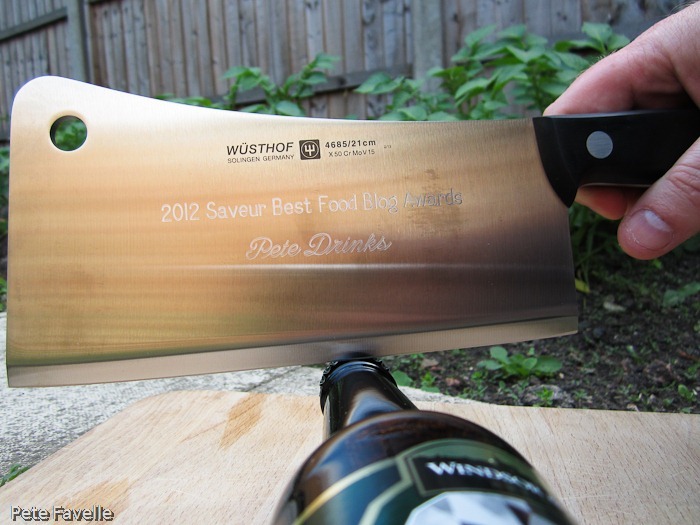 So thank you once again Saveur, both for the award and the totally amazing new bottle opener. Hee hee to Ozzy’s suggestion. Have you actually tried it on a bottle? I use my cleaver for jointing chickens.